I've come to believe that stop-motion animation might just be the perfect vehicle for Wes Anderson's distinctively meticulous style. After all, every single character and set piece is completely under his control, allowing him to project his typically fussy sense of symmetry with immaculate precision. This is not Anderson's first foray into stop-motion, of course. 2009's Fantastic Mr. Fox was met with almost universal acclaim, and awarded with an Academy Award nomination for Best Animated Feature (it lost to Pixar's UP). Anderson's comfort with the medium has clearly advanced in the nine years since that film was released - the animation in his latest effort, Isle of Dogs, is stunningly intricate. It's also an Anderson original (Fantastic Mr. Fox was based on the book by Roald Dahl), so Isle of Dogs is a journey into pure Anderson id, and it is glorious. Dog lovers will find much to rejoice in here. Set in Japan in the near future, ISLE OF DOGS paints a dystopian vision of a world without dogs, in which cat-loving Mayor Kobayashi (Kunichi Nomura) of Megasaki City has banished all canines to a landfill off the coast of Japan known as Trash Island. His official excuse is rampant over population and disease, but his motivations are far more sinister. He begins with Spots (Liev Schreiber), the beloved companion of his young ward, Atari (Koyu Rankin). So Atari does what any 12 year old boy would do if his dog was stolen; he steals a plane and flies himself to Trash Island to track down Spots. There, he befriends a pack of dogs - Chief (Bryan Cranston), Rex (Edward Norton), King (Bob Balaban), Boss (Bill Murray), and Duke (Jeff Goldblum), who set out to help him track down Spots. Back in Megasaki City, an American foreign exchange student named Tracy (Greta Gerwig) has uncovered Mayor Kobayashi's plot, and is leading a student rebellion to save the dogs from certain destruction, while Atari leads his newfound friends on a perilous journey, pursued by Kobayashi's agents, to reunite with his best friend. Isle of Dogs has all the hallmarks of a Wed Anderson film - the symmetrical mise-en-scene, the droll humor, the deadpan line deliveries, and yet as in all of his best films these affectations belie a deeply emotional undercurrent. This is the kind of film that will be a treasure for dog lovers. It's a "boy and his dog" adventure with a distinctly Anderson-ian twist. Atari's growing relationship with Chief is the film's beating heart; a boy who has lost his dog, and a stray dog who has never had a family. Anderson plays loving homage to Japanese cinema, a stylistic choice that has met with accusation of cultural appropriation in some quarters, but is tastefully applied by a consummate aesthete with a clear love for the filmmakers he is emulating here. Anderson has absorbed the work of such legendary Japanese filmmakers as Akira Kurosawa, Hayao Miyazaki, and Jûzô Itami to create something new and unique, a Rankin/Bass cartoon by way of Toho Studios. Anderson never quite reaches the emotional depths that Kurosawa or Miyazaki were able to reach (or even his own Royal Tenenbaums or Grand Budapest Hotel), but there's just something endlessly charming about a boy's quest to find his lost dog, with actors like Cranston, Norton, Schreiber, Goldblum, Balaban, Gerwig, Murray, Scarlett Johansson, Ken Watanabe, Tilda Swinton, Frances McDormand, Harvey Keitel, and Yoko Ono along for the ride. Fantastic Mr. Fox remains Anderson's strongest animated film, if only for the scrappy inventiveness of the animation and the razor sharp screenplay, but Isle of Dogs is an endearing comic romp with a heart of gold that is hard to resist. 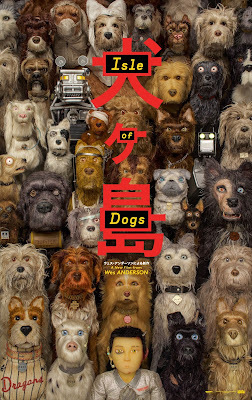 ISLE OF DOGS | Directed by Wes Anderson | Stars Bryan Cranston, Koyu Rankin, Edward Norton, Liev Schreiber, Greta Gerwig, Bill Murray, Bob Balaban, Jeff Goldblum, Scarlett Johansson, Kunichi Nomura, Tilda Swinton, Akira Ito, Frances McDormand, Akira Takayama, Courtney B. Vance, F. Murray Abraham, Fisher Stevens, Yojiro Noda, Mari Natsuki, Frank Wood, Harvey Keitel, Yoko Ono, Ken Watanabe, Kara Hayward | Rated PG-13 for thematic elements and some violent images | Now playing in select cities.